This gallery features photographs sent in by happy parents, depicting their child’s Brit Milah ceremony. Each of the photos features precious newborn boys receiving Brit Milah on the eighth day of their lives. 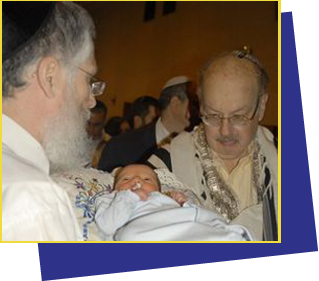 Your child’s circumcision (Brit Milah), will be one of the most important days in his life, even if he is too young to remember it. Rabbi Shimon Miara encourages parents to take pictures to share with children as they get older. Parents are welcome to share those photos here as well, to spread the joy that comes with this sacred ritual. Not only is the circumcision a covenant with God, it is also a covenant with the future, a spiritual agreement between you and your child. Spiritual wellbeing is the foundation of any happy family. In addition to being sacred snapshots, the photos are also tokens of spiritual success handed down from parent to child. They are not just photos, but family heirlooms.